CHURCH, BENJAMIN, soldier and Indian fighter; b. 1639 at Plymouth, Mass., son of Richard Church, who had migrated from England about 1630, arid Elizabeth (Warren) Church; d. 17 Jan. 1717/18 (o.s.) at Little Compton, R.I. The Church family lived in various Massachusetts towns while Richard Church worked as a carpenter. One of nine children, Benjamin was brought up in his father’s trade. Aside from this, however, nothing is known of his youth. He was married 26 Dec. 1667 to Alice Southworth, daughter of Constant and Elizabeth (Collier) Southworth of Duxbury, Mass. Six years later Church took up land at Saconet (Sogkonate, modern Little Compton, R.I.), which was then part of Plymouth colony. In June 1675 he learned from some Indian friends that the chief of the Wampanoag tribe, Metacomet (Metacom, Pometacom), known as King Philip, whose village was on Mount Hope peninsula at the north end of Narragansett Bay, intended to make war on the English. Church reported this intelligence on 16 June to the governor of Plymouth colony. Philip’s hot-blooded warriors began looting and burning on 20 June. Church was given command of a mixed scouting force of English and friendly Indians. The Wampanoags escaped to the eastward, fought a pitched battle on 19 July, and fled to the north into Massachusetts Bay. The Nipmucks and Narragansetts joined with them in warfare, and the latter were defeated in the battle of the Great Swamp in December 1675. Church was wounded and earned a reputation for aggressiveness and personal bravery. In August 1676 his company ambushed and killed Philip. Church cut off his head to exhibit. With the return of peace, Church was appointed a magistrate in Saconet. He acquired other lands and in 1680 helped establish the town of Bristol (R.I.), which he represented in the General Court in 1682. At the outbreak of King William’s War (War of the League of Augsburg) in 1689, he was commissioned a major and commander of the Plymouth forces to be sent eastward to Maine. On 18 Sept. 1689 he landed at Fort Loyal (at Falmouth, now Portland), where Silvanus Davis was in command. A few days later he engaged besieging Indians in a six-hour battle. He then marched up and down the coast and drove off the Indians who were menacing Fort Loyal; they returned the following spring, however, supported by French forces, and took the fort. In September 1690, Church was commissioned again to lead an expedition “against the Common Enemy, Indian & French their Aiders and Abettors,” in an attempt to secure the eastern borders. With 300 English and Indians from Plymouth and Massachusetts Bay, he sailed to Casco Bay and marched to the Androscoggin River, only to find the Indian fort at Pejepscot (Brunswick, Me.) deserted. He recovered some English captives at another fort at modern Lewiston and burned the place. Church fought two more skirmishes on his way back and left some men to guard the Wells settlement. As with the previous expedition, Church felt that the compensation he later received was inadequate. The third campaign into Maine took place in the summer of 1692. At this time Church assisted in the building of Fort William Henry at Pemaquid. 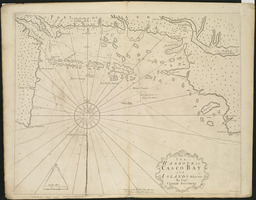 The fourth expedition, in 1696, landed at Penobscot Bay in September in a vain search for Jean-Vincent d’Abbadie de Saint-Castin and his forces. Saint-Castin had participated in raids on Maine settlements, the latest being the capture of Fort William Henry with Pierre Le Moyne d’Iberville early in August. After a skirmish with Indians, Church returned to his ships and decided to sail northeast to Beaubassin (Chignecto). As the inhabitants fled, his forces seized the town and destroyed most of the houses. The expedition moved back to the mouth of the Saint John River and carried off 12 cannon and shot hidden for a new fort. Fearing that the river might be too low for safe passage, Church decided against attacking the fort at Nashwaak (Naxouat, opposite modern Fredericton, N.B.) commanded by Governor Robinau* de Villebon. Upon embarking, however, he met another squadron under Colonel John Hathorne, who had orders to proceed upriver to attack the fort. 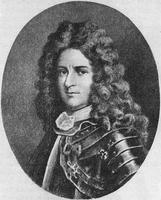 The French were well prepared for the attack, thanks to the scouting of Daniel Robinau de Neuvillette, Villebon’s brother, and the attempted siege failed. In March 1703/4, in the first year of Queen Anne’s War (War of the Spanish Succession), Church proposed himself to Governor Dudley of Massachusetts as the leader of another expedition eastward to revenge the Franco-Indian attack on Deerfield, Mass., on 29 February [see Rev. John Williams]. Dudley commissioned him a colonel for the undertaking and authorized him to conduct coastal raids as far as Port-Royal (Annapolis Royal, N.S.). On the way Church captured, on Green Island near Penobscot Bay, three Frenchmen and an Indian who guided him to Penobscot (Pentagouet, modern Castine, Me. ), where some French and Indians were attacked. Among those taken was Saint-Castin’s half-breed daughter. Church was informed that two French officers, M. Gourdon and Michel Chartier*, were building a fort at Passamaquoddy, and he went there next. Gourdon was taken prisoner, but Chartier escaped. On 20 June (1 July, N.S.) the expedition reached Les Mines (Grand Pré). Church summoned the inhabitants to surrender, which they did. He then burned the town, broke open the dikes, and cut the crops. On the night of the 22d he captured Pigiguit and the next day took Cobequid (Truro, N.S.). The avenging force sailed to Port-Royal, but after a council of war on 4 July decided not to try to seize the town. Instead, Church went up to the head of Chignecto Bay and despoiled Beaubassin again before returning home via Passamaquoddy and Penobscot Bays. Once more Church felt himself poorly rewarded and he retired from military service. In 1705 he was living in Little Compton again, and in 1715 he dictated to his son Thomas his Entertaining passages relating to Philip’s War . . . as also of expeditions more lately made against the common enemy, and Indian rebels, in the eastern parts of New-England. On 17 January 1717/18 he was thrown from his horse, broke a blood vessel, and bled to death. His wife, Alice, survived him only seven weeks, leaving seven children. Church was a devout man who considered that in his military campaigns he was acting as the avenging arm of God. His efforts in the defence of New England and in retaliatory raids on Acadia did much to boost New England morale, and there can be little doubt that Church’s leadership and initiative paved the way for the capture of Port-Royal in 1710. [Church’s autobiographical book, Entertaining passages . . . , which offers the most complete account of his military activities, was first published in 1716 and today is a book of extreme rarity. It has been edited in two volumes, with copious footnotes and additional biographical introductions, by H. M. Dexter: History of King Philip’s war (Boston, 1865–67). The second volume is subtitled The history of the eastern expeditions . . . The Maine Historical Society has published occasional letters of Church, remarkable for their orthography, in its Collections, as has the Massachusetts Historical Society in its Proceedings. He is mentioned in various documents published in New Plymouth colony, Records of the colony of New Plymouth in New England (1620–1692), ed. N. B. Shurtleff and David Pulsifer (12v., Boston, 1855–61), V, VI, VII. French accounts of the 1704 expedition can be found in, AN, Col., C11D; Coll. de manuscrits relatifs à la N.-F., II, 416–21; and Rameau de Saint-Père, Une colonie féodale, I, 326–28, who mentions some skirmishes around Port-Royal after the council of war of 4 July 1704 which are not described in English accounts of the incident. Howard H. Peckham, “CHURCH, BENJAMIN,” in Dictionary of Canadian Biography, vol. 2, University of Toronto/Université Laval, 2003–, accessed April 24, 2019, http://www.biographi.ca/en/bio/church_benjamin_2E.html.